At Family Kia, we believe in providing the best shopping experience possible. Everything we do, from our model sale prices to our friendly staff, is motived by helping you find the best car that suits your needs. And our YouTube channel is another way we provide frequent updates of what we have on the lot! See the nice variety of informative videos we have for you to make your vehicle shopping easier at our YouTube channel! And more! Be the first to see what new models we have in stock, and you can also subscribe to our channel to receive updates as they come in! Go to: Family Kia New Model Videos! 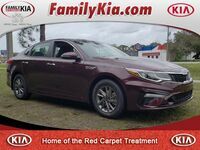 Experience the Red Carpet Treatment At Family Kia of St. Augustine FL! Please check out our YouTube videos, call us at (904) 808-0542, or visit us on the lot for information about the models, or for a test drive. In addition to all these benefits, all new Kia models come with industry-leading 10-year / 100,000-mile warranty coverage. That’s some great peace of mind. Plus, we offer our exclusive 3-Day Love It Or Exchange It Guarantee, where if you don’t absolutely love your new Kia vehicle, and have driven it less than 300 miles, you can bring it back and exchange the vehicle within 3 days! Save More at  Family Kia  of St. Augustine! Family Kia is a local, family-owned dealership at 2665 U.S. Highway 1 South, St. Augustine FL. We also serve Palm Coast, St. Augustine Beach, Nocatee, Hastings, Ponte Vedra Beach, St. Johns and Jacksonville, among other local cities. Please check out our YouTube videos, call us at (904) 808-0542 or visit us on the lot so we can set you up with a test drive, or check back here at www.familykia.com.